The Maratha community held its 58th silent rally in Mumbai on Wednesday that was supported by lakhs of people from Maharashtra. Starting from Byculla Zoo in south Mumbai, the saffron Maratha Kranti Morcha passed through JJ Flyover and ended at Azad Maidan. 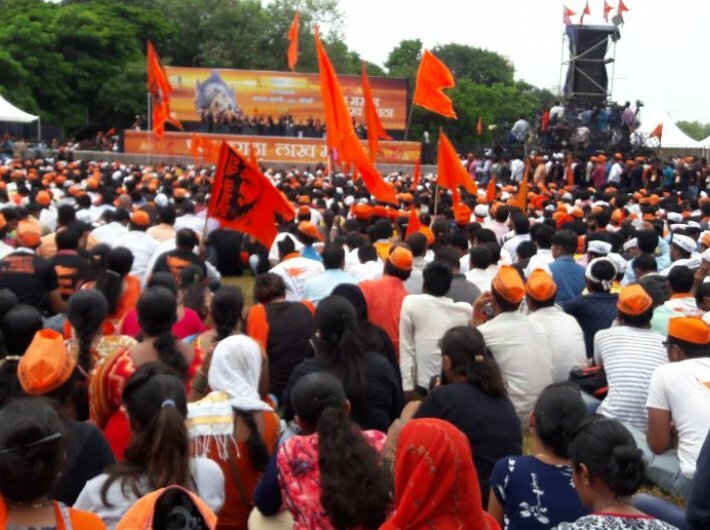 Organised by Sakal Maratha Samaj, an umbrella organisation of community groups, the protest rally was interspersed with slogans like ‘Ek Maratha, Lakh Maratha”, “Tumacha Amacha Nata Kai”, “Jai Jijau, Jai Shivrai,” “Chatrapati Shivaji Maharaj Ki Jai”. Marathas account for 32% of Maharashtra’s population. They are demanding a reservation in educational institutes and jobs. Social media platforms like Facebook, WhatsApp and Twitter were used to mobilise the community members. More than 10,000 police and traffic personnel, drones and CCTV cameras were used to control the huge inflow of people and vehicles. As a precautionary measure, all schools in south Mumbai were also shut. The delegation of protesters met chief minister Devendra Fadnavis. The issue was also raised in the assembly. Fadnavis consulted opposition leaders like Ajit Pawar, Jayant Patil and Dhananjay Munde of the Nationalist Congress Party (NCP) and Narayan Rane of the Congress. He assured the protesters that all facilities and subsidies available to the other backward classes (OBC) students would be made applicable to Maratha students and promised the Maratha community fee concession in 605 educational courses and interest-free loans up to Rs 10 lakh for self-employment. He added that for skills development, students will be given skills training by Annasaheb Patil Corporation. Government will give additional funds to the corporation. Fadnavis also assured that Rs 5 crore will be given to each district for the construction of hostels and setting up of a district-wise committee to decide on cases filed under the Atrocities Act. On the Kopardi case, Fadnavis said that the case was nearing closure and arguments would soon begin in the fast-track court.